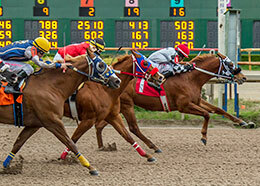 Fast N Fun Jordan, under jockey Victor Urieta, Jr., winning the $49,874 Louisiana Downs Maiden Stake (not black type) on Saturday at Louisiana Downs. BOSSIER CITY, LA—FEBRUARY 9, 2019—After going winless in seven starts in 2018, Fast Fun Jordan notched his second consecutive win of the new year with a half-length victory on Saturday in the $49,874 Louisiana Downs Maiden Stake (not black type). Swampi veered in at the start and was disqualified from second and place ninth, moving Tdz Going Nuts to second and Black Heaven to third. Ridden by jockey Victor Urieta, Jr., Fast N Fun Jordan completed the 350 yards over a "good" racing surface in :17.528 seconds. Into a 10-mph crosswind he recorded a career high 101 speed index. The $22,443 winner's purse boosted the 3-year-old's career earnings mark to over $36,680. Juan Diaz, Jr. owns and trains the son of leading third-crop sire Fast Prize Jordan from the Streakin La Jolla mare Streakin Fast N Fun. Fast N Fun Jordan is a $5,700 LQHBA Yearling Sale graduate. Jen Sokol, LAD Racing Office Manager, presents the winning connections of Fast N Fun Jordan the Louisiana Downs Maiden Stake trophy on Saturday. "He loaded well and was very focused," Diaz, Jr. said following the gelding's biggest career win. "The interference by Swampi did not bother him. Our horse kept his cool and was just going for the wire." Fast N Fun Jordan broke his maiden in the trials with a neck win over Black Heaven, entering today's final as the fifth fastest qualifier. 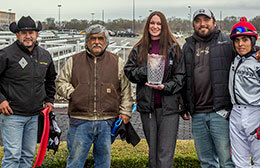 Diaz, Jr. indicated the next start for the gelding will be at Delta Downs later this year. Tdz Going Nuts earned $8,478 after getting moved into the place position. Rosendo Valdez, Jr. conditions the son of multiple stakes sire FDD Going Grand for owner Americo Ramirez. Tony Doughtie bred the 3-year-old gelding from the Hadtobenuts mare Thequeenhasgonenuts. A finalist in the LQHBA Laddie Futurity(RG2) last year, Tdz Going Nuts has earned over $30,000. Luciano Duenez was riding. Racing for owner Alejandro Sanchez, Jr. and trainer Jose Garcia, Black Heaven picked up $4,987 for third. Jockey Jorge Linares rode the Jet Black Patriot 4-year-old from the Brookstone Bay mare Shawne Bay. Donald Ray Plain, Jr. is the breeder. Completing the official order of finish were Rigsby, Quentonian, Jet Black Felissa, Rebas All In, Special Dashing Miss, Swampi and Ace Black Patriot. Contributing reporting by Martha Claussen.